This morning I find myself fighting for words not that I am at a loss for words but just the opposite because someone I care about whose life is spinning so fast centrifugal force is tearing them apart what words can I say that will bring not only comfort to them but help them put their lives together as well. Do you know someone like that? Is it possible that someone is you? The old adage “a picture is worth a thousand words” is so true however I’d like to take that a little further, “the actual presence of is worth a thousand pictures.” This Christmas as your shopping for Christmas presents remember it’s your presents and presence that is what people need. This morning’s Advent Prayer is a living testimony to God’s gift of Jesus and Jesus’ presence in my life. 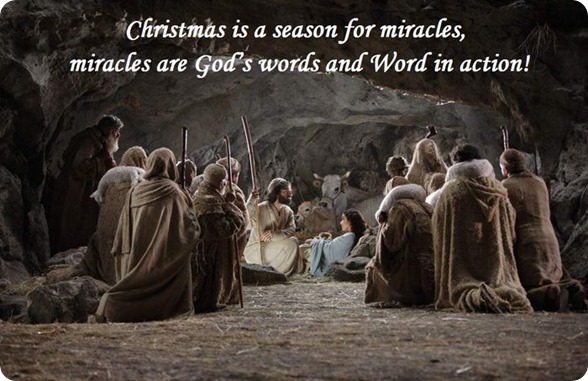 Christmas is a season for miracles and miracles are God’s words and Word in action!